Apple's slightly overdue update to iTunes is out. Finally. It's a sizable re-imagining of a piece of software used by a massive amount of people. So you should probably take a minute or two to acquaint yourself with the new stuff. Here's what's changed. If you want to download iTunes 11 now, just check your Mac App Store software updates (or Apple Software Update for Windows), or keep refreshing here. iTunes is fast now. Which is crazy. iTunes hasn't been fast in years. But iTunes 11 feels legitimately lightweight and like something you wouldn't mind running all the time. That's a huge change. Search, scrolling, anything—in any view—is all lightning quick now. One of the biggest changes is how you get around in your Library. The old left-hand bar with Music, Movies, Podcasts, etc. is gone, replaced with a drop down in the top left of the app. The change frees up loads of screen space for more information, but also makes navigating to different forms of media slightly harder, so it's a trade-off. If you decide it's not worth the trade, you can get it back by clicking on View > Show Sidebar. You can get the status bar on the bottom back in the same way. Apple's new "Expanded View" looks like a cross between the classic information-based view when you'd click an album and Cover Flow. Basically, it shows you the songs in an album (or presumably from an artist you clicked), and keeps the Cover Flow-like view across the top, just not as massive and visually overpowering as it is now. The upshot is that it makes navigation easier, sort of, since you're not dumped totally into a list view. But it'll probably feel extraneous to a few of you who find the navigation options (just the albums or artists immediately before or after what you've selected) not worth the wasted space. The new Artist view, though, is totally great. Artists and Searches are now handled with a sidebar on the left, and only the applicable songs appear in the main pane. Podcasts especially benefit from this change. You know how when you're shopping for music, you'll preview a song or two from an album, just to make sure this is, in fact, the catchy or angsty or depressy single you're looking for? iTunes saves all of those clicks now, which you can get to by hitting the Preview History button. No more stealth drive-bying the new Britney album in the store for you. This will either be the most minor change, since most of you probably don't use the MiniPlayer, or be the thing that finally gets people to actually use the MiniPlayer. Apple's stripped off most of the controls, like skip forward or backward, play and pause, and volume control, since Macs have hardware buttons for that now that are more efficient than using the mouse or trackpad. Still, they appear if you mouseover the pane—they're just out of your way when you don't need to look at them. The standard buttons check the next few songs, search the rest of your library, or just expand to the full window, or allow you to select which speakers (via AirPlay) you want to use. It's probably not quite as efficient as keeping iTunes in a separate Space, but if you like having iTunes on your desktop in some form, it's a nice and thoughtful change. It's not a huge overhaul—the basic organization seems the same—but Apple's unified the iTunes Store look and feel across your phone, tablet, and computer. Everything's done with the general design language of the broader iTunes 11 revamp, but we'll let you know if anything significant turns out to have changed under the hood. 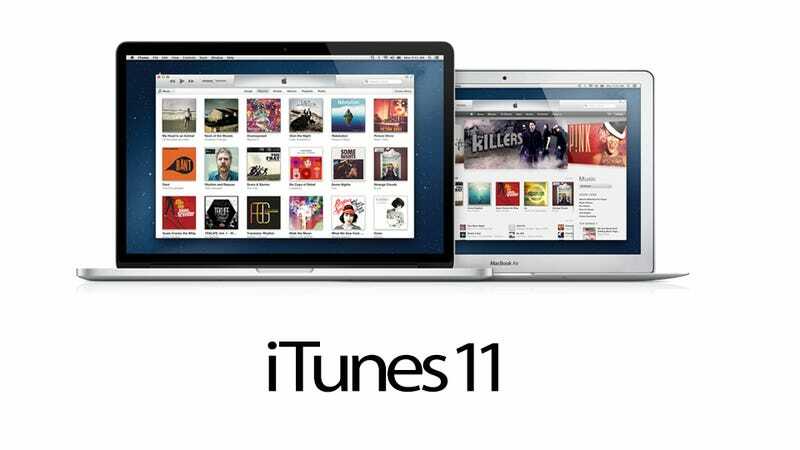 With iTunes 11, if you pause movies, TV shows, podcasts, audiobooks, or iTunes U files on one device—say, your phone—you can start them back up on another device and pick up where you left off. This is the same cloud bookmarking that Amazon's used with Whispersync, and Netflix has had forever—and that Apple uses with iBooks and Safari—but it's nice to see it come to other sort of media. We're not sure if this works with Apple TV (we suspect not) but we'll update to let you know. It looks kinda dopey, but it does sort of scream "iCloud", doesn't it? Apple's gone out of its way to make these non-intrusive—you have to click an "In the Store" button to even see them—but there are recommendations for stuff you should buy based on things that are in your library now. This isn't one of the more publicized features, but it's one to keep an eye on. If you buy a song from iTunes on your iPhone, it'll pop up in your computer's library. But that doesn't mean you've downloaded it; instead, iCloud just loads a placeholder, which you can use to stream the song instantly. You have to click a separate download button to get the file itself. This is could be the next step toward Apple making iTunes more of a hybrid locker/store, similar to Google Music or Xbox Music.